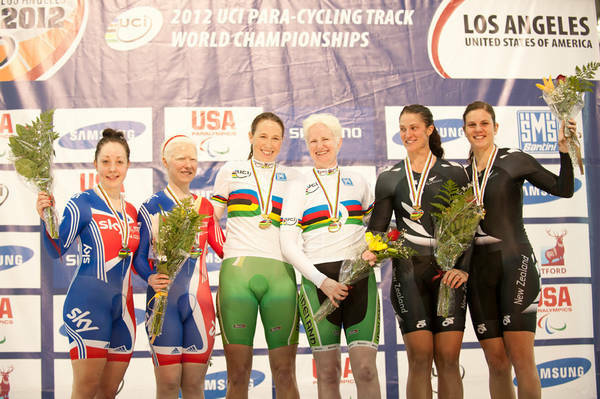 Irish cyclist Fran Meehan and her partially-sighted partner Catherine Walsh won Gold at the World Para-cycling championships in Los Angeles recently. Here Fran describes for us what it’s like to race at that level. This training camp was all about recovering from jetlag, resting (lying around the hotel between track sessions) hydration and the dreaded weighing scales. The fact we are self-catering really helps to keep the weight down, but just takes that extra bit of planning and teamwork. The track sessions are very intense but short which builds speed in the legs without inducing fatigue, unlike the last camp in Palma Majorca (in Spain) when we were doing anywhere up to five hours a day. The goal is to keep the goal the goal… as our strength coach would say while he batters us in the gym. The goal is to stay calm, focused and go very fast. The morning of the 3km pursuit we eat a light breakfast, preload race fuel, and then head to the track to warm-up. The turbo warm-up is a very specifically planned 70 minutes to deliver us to the bike which is set and locked in the starting gate on the track. Three minutes from the off we sit side by side on the holding chairs waiting of the call to mount the bike. This three minutes feels like a life time, at this point you have to shut out the crowed the other bike on the opposite side of the track, and just focus. When the call comes, Catherine and I give each other the nod as if to say lets rock and head to the bike, walking on to the track we mount the bike, check the pedals and wait for the countdown to start. Ten seconds to go with everything checked, big deep breaths looking up the track, five seconds to go the focus is the start, two seconds engage the core muscles, one second up and rock back, zero trust forward with all the power you have to move the bike as fast as possible straight down the track. 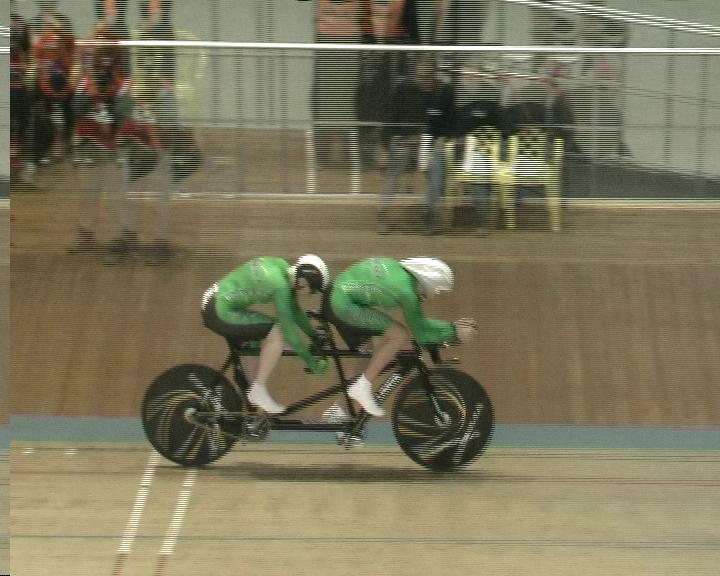 We stay out of the saddles for three quarters of the first of twelve laps to get the bike up to speed. Once seated we drive into the bend to continue to build speed on the home straight I move my arms from the drops to the tri bars for the most aero position possible. Lap two begins, the goal here is to not to overcook it, it feels easy the adrenalin is up and your buzzing, but going too fast here is race suicide. We sit on the speed. The third lap we settle on the time and try to hold that speed, our goal is 17.7 seconds per 250m lap and the aim is not to let drift by more than two tenths of a second per lap. Lap by lap we keep the same rhythm driving out of the bends and working the straights, this track is nice for a tandem. It has long straights tight bends, which makes my job of riding the lines easier, and with the tight bends it flings the bike out of the bend at an average speed of 49kph. When the lactate levels rise, legs begin to burn and fatigue sets in; usually with four laps to go. Everything by now is a blur seconds seem like hours, all I can hear is my breathing, the black line on the track seems to rise up to meet me, I’m seeing stars and begging to hear the bell for the last lap. The line arrives some seventeen plus a few tenths of a second later I flick the bike up the banking and try to read the timing board, hopefully we are happy with the result. Then it’s down to the track side to where our coach and team manger help us off the bike, because the legs will not hold up. Standing on the podium getting your medal and flower knowing that you’re in the national jersey is a nice feeling this is really the little thanks we can give to all those who helped us get here, without the support of our team we build around us; our family, partners, coaches, massage therapists, bike mechanics and the sponsors Cadbury Ireland, Continental, Richies bike store Swords, Tullamore Court Hotel, and Buckley Cycles Tullamore. What a great report. I was breathless as I read it! Makes it even more nail-biting knowing her partner is partially sighted. Wow! @Snowcatcher - thought you'd like that one, she really captures how they feel.